Faherty Law Firm is presenting multiple defenses to the request for eminent domain power by Sunoco Pipeline. 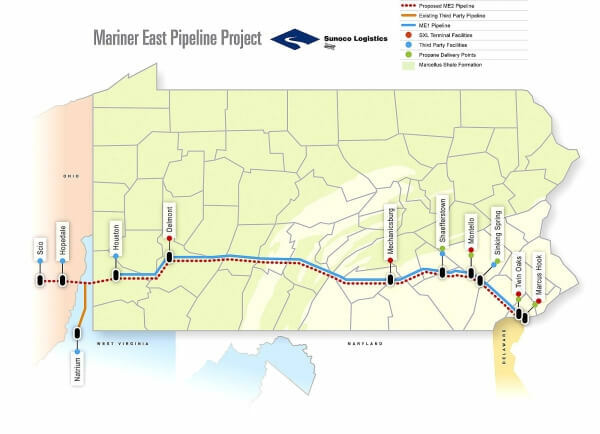 Sunoco Pipeline LP of Pennsylvania has again filed eminent domain documents in Washington County Court, seeking temporary and permanent rights of way on land in three townships and one borough to move natural gas products as a part of its Mariner East project. This is the fourth time Sunoco Pipeline filed documents regarding land in and around Mt. Pleasant, Independence and Chartiers townships. The most recent filings Friday also seek land in Hopewell Township and West Middletown. If the petitions are granted, Sunoco Pipeline would permanently acquire 11 acres. Sunoco Pipeline sought eminent domain power in Washington County via Petitions to Approve a Bond. Mike Faherty represents property owners. The judge stayed, or delayed, the Sunoco effort. He also provided a schedule for Mike Faherty Actions in Equity which could deny the attempt to obtain eminent domain and award costs to be paid by Sunoco Pipeline for the property owners. Sunoco has responded by recharacterizing the Mariner East 2 Pipeline as now being only within Pennsylvania! Sunoco is attempting a different procedure, the filing of declarations of taking. Mike Faherty is continuing his protection of property owners rights by filing preliminary objections in multiple counties. Property owners served with condemnation documents are encouraged to promptly obtain the legal services of an attorney experienced in protecting property owner rights. Sunoco Pipeline has often stated that it has eminent domain power for the Mariner East 2 Pipeline. Faherty Law Firm represented many property owners in 2013 and 2014 against Sunoco Pipeline. That litigation resulted in Mike Faherty’s litigation win against Sunoco Pipeline in the York County case of Loper v. Sunoco. The Judge ruled that Sunoco Pipeline did not have the power of eminent domain for Mariner East 2. Williams Company has been offering option agreements in the effort to acquire property rights for the Atlantic Sunrise Pipeline. Faherty Law Firm represents many property owners threatened by the pipeline. Mike Faherty has pointed out that the permanent irrevocable options could place and encumbrance, or restriction, on property use for many years without payment of just compensation. Williams refused to compromise on that easement term, but recently reversed its position. Mike Faherty is negotiating easement terms and full just compensation for property owners. Sunbury Pipeline, LLC has stated it has the power of eminent domain as a public utility corporation under the Pennsylvania Business Corporation Law. Faherty Law Firm represents multiple property owners threatened by the pipeline. Mike Faherty has advised Sunbury Pipeline that the pipeline which is progressing with an application to the Federal Energy Regulatory Commission (FERC), is under FERC, not state, jurisdiction. Faherty asserts that the argument for current state eminent domain is misguided. Faherty, noted that the FERC approval of eminent domain power is expected near the end of 2015, but has not yet been provided.